DIET & NUTRITION: Blueberry vinegar may fight dementia by improving cognitive function. Learn about improvements to short-term memory in the lab as reported in The Journal of Agricultural and Food Chemistry. 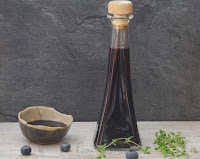 In the search for new ways to fight cognitive decline, scientists report in ACS’ Journal of Agricultural and Food Chemistry that blueberry vinegar might offer some help. They found that the fermented product could restore cognitive function in mice.